Most online collaboration services are task-centric: They’re built to facilitate meetings or document creation and sharing, and chat is an accessory. 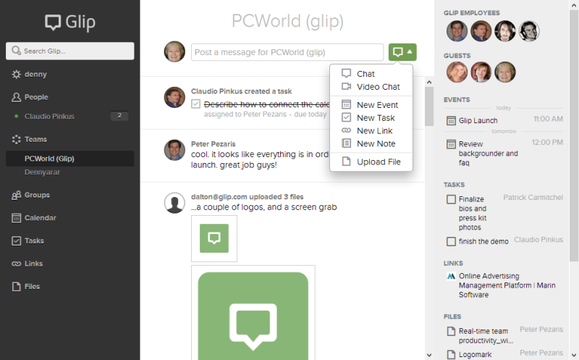 Glip takes a different view, enabling collaboration tasks from within a real-time chat interface. The Web-based service, which formally launches today, seeks to eliminate the need for groups of co-workers to juggle multiple applications to create, share, and edit content; schedule tasks and events; and generally brainstorm. Glip stores chat and content indefinitely and provides links and search tools to help you find and review conversations surrounding group actions and decisions—one of its more potentially useful features. An iOS app is awaiting approval and an Android app is due by the end of the year. However Glip suffers from limited support for existing third-party tools. For example, you can’t work on Microsoft Office files within Glip—you can only upload and download them. Glip’s chat-centric interface is flanked by two columns. On the left are the individual’s account settings as well as lists of co-workers with Glip accounts; groups (consisting of people within the organization—for example, departments) and project-oriented teams (which can include invited outsiders); and links to your Glip calendar, task list, links, notes, and files. In the right-hand column are thumbnails of fellow Glip users and detailed lists of links, files, events, and tasks that have been created and/or shared within the current Glip group or private chat window. Glip organizes collaboration around a Facebook-like chat timeline. The wide center pane looks generally like a cross between a group chat room and a Facebook timeline. Newer posts appear at the top, and your input window is on top of the chat timeline. To the right of the chat input field is a clickable button that summons a pop-up menu of Glip plug-ins, which at launch include apps for choosing traditional chat or video chat; creation of notes, events, tasks, and links; and uploading files. You can type a comment to accompany any of these actions, which produce appropriate data entry fields in the timeline (as well as your chat). For example, clicking on “New Event” in the pop-up menu produces fields for a calendar entry—date, start and end times, whether the event repeats, and (optionally) location and description. When you create an event while in a group or team window, it shows up on everyone’s built-in Glip calendar. Tasks with deadlines also appear on Glip calendars, but you can assign tasks to individuals. Interestingly, Glip does not have a permission structure—the assumption appears to be that anyone making an assignment is doing so following a discussion in the chat window. You can opt to have your Glip events automatically added to a third party calendar (e.g. Google Calendar), but the syncing doesn’t work both ways, so you can’t check your third-party calendar for possible conflicts from within Glip (something future releases will hopefully address). The note app lets you create documents with basic formatting tools (similar to those in most email apps). Once you’ve posted a note, others in your group or team can access and edit it. But at launch, these notes have no real life outside of Glip—you can’t download them, which seriously limits their usefulness. The file upload app lets you use Glip for document sharing: Once someone in the group has uploaded a file, you can download it, either from the timeline or from the list of files in the right or left-hand columns. Glip puts discreet notices in the left nav bar when someone sends you a message—but it also sends you email to notify you of activity when you’re offline. However it’s fairly obvious that Glip’s creators expect you to more or less live within Glip, which may not be a realistic expectation. Glip offers a 60-day trial, after which it will cost $5 per user per month (or $50 per user per year, up front). If it learns to play more nicely with other productivity apps and services, Glip could be a useful tool for businesses involving small groups that benefit from frequent and easy communication—and quick access to its history.